Many patients who visit our practice want to significantly reduce or eliminate the need for corrective eyewear. 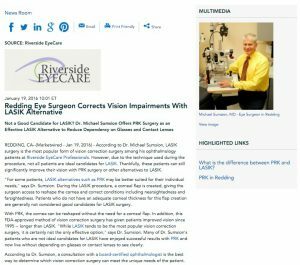 While LASIK tends to be the most popular vision correction surgery, it is certainly not the only effective option. In fact, for some patients, LASIK alternatives such as PRK may be better suited for their individual needs. PRK, more formally called photorefractive keratectomy, is an FDA-approved vision correction procedure that actually has a longer history of success than LASIK. Since 1995, ophthalmologists have been using PRK to reshape the cornea and help patients see with dramatically increased clarity. In addition, PRK has been used by many of our patients who are not ideal candidates for LASIK surgery due to the thinness of their corneas. LASIK surgery can also dramatically improve your vision, and works by creating a corneal flap, which allows the surgeon to reshape the cornea beneath. As a result, good candidates for this procedure must have a cornea with adequate thickness to create the flap. Many of our patients who have undergone LASIK now enjoy 20/20 vision. During the consultation process, you will undergo an eye exam to determine the health of your eye, the thickness of the cornea, and discover which method of vision correction surgery can best achieve optimal results. If you would like to learn more about PRK or LASIK surgery, or would like to schedule a consultation, please contact us today.